The Bohemian Football Club was recently contacted by the Bob Marley representative agency in connection with our away jersey for the 2019 season, which featured an image of Bob Marley. Bohemian Football Club acted in good faith and followed the correct process when purchasing the licence for this image via a world-leading third-party photo licensing company. However, the Bob Marley representative agency has informed us that this company did not have the right to grant any such licence for this image. We are dealing with this separately. Subsequently, following direct correspondence with the Bob Marley representative agency, they cannot license the image to the Bohemian Football Club due to their own contractual and other obligations. Consequently, we can no longer supply the jersey with the image of Bob Marley as advertised. For anyone who already registered for the 2019 away jersey, we are offering, at your discretion: 1) a full refund of the price paid, 2) a shop credit note or 3) the new redesigned away jersey. Details of how to apply for this are at the bottom of this page. 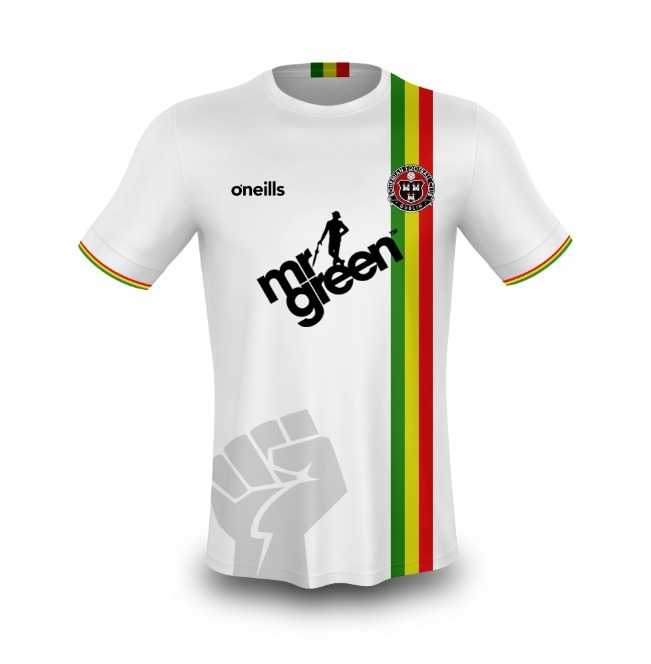 We greatly regret that we cannot offer the original jersey as designed but believe that the new design, while maintaining the colour scheme for a nod to Dalymount’s musical history, also brings with it a powerful message. The clenched, raised fist, is a a symbol of solidarity and support used to express unity, strength and resistance. The League of Ireland faces the might of the EPL every day, Bohemian FC – like other 100% fan-owned clubs – faces the challenges of the privatisation and commercialisation of football across the globe. We have decided to give 10% of our profits from this jersey to a fund, which will continue the already fan-led and previously fan-funded initiative of bringing people living in Direct Provision to games at Dalymount Park. These are among the most unrepresented people on our island. 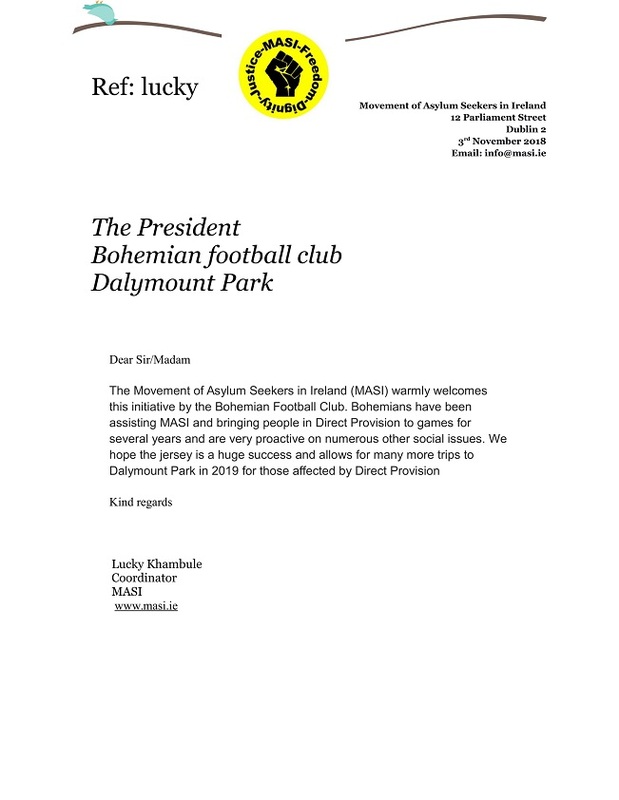 Lucky Khambule, coordinator of Movement of Asylum Seekers in Ireland, said: “MASI warmly welcomes this initiative by the Bohemian Football Club. Bohemians have been assisting MASI and bringing people in Direct Provision to games for several years and are very proactive on numerous other social issues too. We would like to highlight to many who perhaps are unfamiliar with the Bohemian Football Club, that we are a wholly fan-owned club since 1890 and stand in stark contrast to many other clubs globally who have become privately owed and operated. We are a club of the people striving to contribute positively to the city of Dublin and are extremely proud of our club and our stadium, Dalymount Park, with its vast sporting, musical and cultural history. Finally, the Bohemian Football Club would like to thank the thousands of people who made contact with the club since the pre-order release, from over 45 countries in 5 continents. We were astonished at the truly global reaction we received. Bohemian Football Club will be making no further comment will be made about this subject. You do not need to contact us if you are happy to receive the redesigned away jersey. Anyone who has not expressed a wish to have a refund or be issued with a credit note/store voucher will receive the redesigned 2019 Bohemian away jersey as originally planned by mid-December.